A luxury Hebridean hideaway in the Outer Hebrides of Scotland. "...your perfect escape to the magical Hebrides...."
Stayed for eight days and had the most relaxing Christmas ever. Saw an Otter,seals & wild ponies ! The Croft is so well equipped I wanted for nothing and cooked some of the local produce ie lobster & langoustine! I will definitely return many thanks . The Sheiling by the bay is a wonderful, get away from it all, place to stay. After a day spent discovering wild empty beaches and finding great places to eat it was a joy to return to a warm 'home'. The underfloor heating and traditional peat fire added to the charm. The cottage has everything you could think of for a most enjoyable holiday away from it all. The added bonus is a restaurant a few minutes walk away. If you want night life, shops and crowds do not come here, however if you want luxury, peace and quiet, book it now. This was our second visit to the cottage and it was every bit as special and enjoyable as the first. This time we were travelling with our baby son and Angus went out of his way to accomodate us, ensuring that we had an absolutely fantastic holiday. This is truly a special place to stay, and contains every possible home comfort, not to mention a beautiful peat burning fire and some of the most incredible landscapes I've ever enjoyed. If you would like to holiday somewhere quiet, very comfortable, luxurious, relaxing and stunning inside as well as outside, this is the place for you. Thank you Angus and team! Our stay at The Shieling by the bay was one of the best self catering experiences we have ever had. Much of this was due to the care, attention and detail that had been planned to ensure that every need could be met. This started with the welcome on arrival, including champagne and a food hamper, planned so we could sample local products from the start of the holiday. It was interesting to able to read the history of the cottage and follow the journey of how it was rebuilt until the present day. There was an extensive library of books and maps that helped us plan our walks and activities throughout the walk. The emails from the owner before we arrived enabled us to plan and book a boat trip early in our week at the cottage. The owner answered emails during our stay, and was incredibly helpful and professional throughout. The furnishings in the cottage were perfect, everything had been thought through so carefully, and were in keeping with such an old Croft, yet luxurious enough for comfort. The peat fire was a favourite, with enough peat cut and dried for many fires. Wonderful stay in a special place. Five stars. A privilege to be able to stay in such a lovingly and beautifully restored thatched cottage on these remarkable islands. Total tranquillity, comfort, wonderful hospitality, a fine restaurant next door, remarkable landscapes wherever you go. Short sea tours for marine life. RSPB tours for rich birdlife, animal life and flora of the unique machair. Empty beaches and stunning rocky shorelines. A rich and diverse heritage and culture, still alive. History and archaeology. There is so much to be discovered in the southern Hebrides with only a little effort, and Airidh a Bhaigh offers a fantastic comfortable location from which to explore. The hosts are super-thoughtful and all the islanders are super-friendly and helpful. A genuine five star welcome and hospitality. This is the best holiday cottage we have ever stayed in, attention to detail second to none. The cottage has been lovingly restored by the owner and everything has been done to a very high standard. The quality of the pans & cooking utensils is excellent, bedding everything!! Angus has placed numerous seating areas around The Sheiling which allowed us to take advantage of the sunshine and the different views. To have a small sea loch at the back of the cottage was amazing, one early morning I had the privilege to see a sea otter, Grey Heron also frequented the bay along with other birds and wildlife. Our host was very attentive without being intrusive,phoning us next morning to ensure we had everything we needed. When we arrived at 10.00pm at night Lena was waiting ,welcomed us and showed us around, there was a very generous welcome hamper and a bottle of fizz on ice waiting for us!! The hamper saw us through till Monday giving us older jaded travellers time to recover! Ample fuel for the peat fire was available which we enjoyed on a couple of wet days. Recommendations of were to visit and eat was very helpful. A truly fabulous place to say in idyllic surroundings. Excellently restored Cottage in an Idyllic Setting. Lots of Luxury packed into this Cottage. Appreciated the warm welcome by Lena and the Contact and Help by Angus. Location afforded easy drive to all of North and South Uist. Loved everything about this cottage, from the amazing 360 views of sunrises and sunsets, the wonderful gift basket and the charm of the cottage itself, which was immaculate and beautifully refurbished. We found lots of good information in the folders about places to visit and eat. Given the off the beaten path location, it's great to have a restaurant within short walking distance of the cottage. Around the cottage we saw a lot of moorland and open country birds (breeding waders, Arctic Tern, Twite) and some great fly-bys of Hen Harrier and Short-eared Owl. Perfect if you're looking to get away from it all, and extremely comfortable. Ideal property for both relaxing and exploring the area. There is everything you could think you would need for your stay and more. The cottage was cosy, warm and had everything you could possibly want to make your stay comfortable and enjoyable. Really helpful to have Lena waiting for us on our arrival to show us around the cottage and answer any questions - contact with the owner has been very friendly and helpful. Amazed by the lovely welcome pack full of local goodies (well if you count champagne as local?) - this was a very welcome surprise. The cottage is in a lovely quiet location, well thought out and finished with really nice craftsmanship. If you love to get away from it all - enjoy the outdoors and wildlife and still want somewhere really nice to come "home" to - this would take some beating. What an amazing job the owner has done. Every thing has been thought of. The perfect spot to use as a base for fishing or stay put and read in tranquility. A beautiful cottage has to be seen to be believed. The cottage was everything we expected and much more. Beautiful cottage in a lovely peaceful setting, has everything you need to relax and enjoy your holiday. A lovely peat fire all the cooking equipment required and a nice deep bath for relaxing in with a glass of wine after a long walk along the beach. And all the lovely hand made furniture. We had a very warm welcome and the fire was lit for us, an exceptional welcome pack. This cottage is a must for anyone looking for a truly different self catering holiday a real treat to stay there. The shelling by the bay is a fantastic place to stay in a beautiful location.The cottage has everything you could possibly want and more .We had a lovely warm welcome by Leena who took great care showing us round and explaining how everything works .. A great deal of care has been taken to make sure you have a great holiday . The bedroom and bathroom are beautiful and so comfortable we slept like logs .Angus went above and beyond to help us rearrange our ferries due to bad weather can't thank him enough ..We had a fantastic welcome pack with champagne chocolates and local products which were great . Don't change a thing it is perfect . We had a very comfortable stay at this fantastic cottage. It exudes quality, character and charm and combines luxury and homeliness. It was very well equipped indeed and we received a very generous welcome pack which we thoroughly enjoyed. Very many thanks. The cottage is in a very central position on the Uists making it handy for visiting the whole stretch from Berneray to Eriskay. It really is a special place. Beautiful property finished to the highest standard in a picturesque location. Welcome pack outstanding. Couldn't ask for anything more. As we approached, we loved the fact that The Shieling was partly camouflaged against the hillside standing sentry over the bay. Lena was there to welcome us which was lovely. The cottage is beautifully appointed with some lovely touches. The day after we arrived we got a call from Angus to check that everything was ok. We felt as if nothing was too much trouble and that their entire objective was that their guests should have a fabulous stay at The Shieling. We did! True five star accommodation in an idyllic location. Attention to detail is second to none, from the welcome pack, to the unlimited supply of peat for the fire. Both Otter and Seal seen from the property! This is first class accommodation with first class customer service. I have holidayed in many self-catering cottages over the years but have never stayed in one with the home from home feeling combined with comfort and luxury of the Shieling by the Bay. The booking process, preparation, provision of information, welcome, location, standard of fit and finish and the beautiful welcome pack were all first class. The location is accessible for South Uist, North Usit, Benbecula, Eriskay and Berneray whilst at the same time being quiet with no through traffic. There are some great shops and food providers including Salar, Maclennan's and McLean's, and you want for nothing. The weather was not great but the dramatic scenery and wildlife, combined with the cozy luxury of the Shieling by the Bay and far too much Salar smoked salmon more than made up for it. We saw otters, a seal and an eagle from the property and the strategically placed benches and seats (all five of them) around the property are well placed to take advantage of every view and the sun. We thoroughly enjoyed and recommend the Shieling by the Bay. This is our second visit as we found the property so comfortable and appealing with the peat fire and excellent provision of equipment. As usual we were met with a terrific welcome pack provided by Angus and greeted by Lena who made sure everything was just right. A very good holiday! Áiridh a' Bhaigh, a step back in time. We arrived at the Sheiling to a warm welcome, peat burning on the stove and a bottle of Harris gin on the table! A beautiful cottage with bespoke finishing's throughout and very well appointed down to GHD hair straighteners and everything we could have wanted in the kitchen and a wonderful bathroom. We enjoyed many sightings of Golden Eagles, Hen Harriers and Sea Eagles from a boat trip on the Lady Ann from Kallin harbour - a worthwhile 2 hour trip. A family of seals entertained us with their antics in Loch Carnan while we enjoyed the evening sunshine and a glass or two of wine. The cottage is ideally placed to visit both the north and south of the island and for a day trip to Barra, a beautiful island and only 40 minutes on the ferry. The Sheiling was the perfect place to explore the hillsides and old cottages, discover the most beautiful beaches and take life at a leisurely place and recharge our batteries. A perfect holiday! A stunning thatched crofter’s cottage rebuilt to the highest standards! We have stayed in many cottages over the last 30 or so years and this wins by miles. No expense has been spared in the renovation of this cottage. Bedroom furniture has been made by hand in various woods to an unbelievable standard and has to be seen to be believed. No cheap and cheerful bedding either, a silk duvet no less! Bathroom furniture includes a multi head shower, a double end cast iron bath and more stunning handmade furniture constructed with various woods including Yew. Moving to the living/dining area there is a leather suite with recline function, a fully functioning kitchen with nothing missing including a multi electric oven and 5 burner gas hob with wok and wok burner. Surrounding the room are various artefacts from yester year including a National powdered baby milk tin, a spinning wheel and numerous other bits and pieces. Sky TV and internet is included. In the garden outside there is a substantial collection of old bottles which may contain a bottle from the SS Politician (Compton McKenzie/ Whisky Galore) and an outhouse with washer/dryer, freezer, iron and ironing board not to mention an ice maker as well. Also included is a cast iron stove with all the peat you can use, not really required in summer but very nice to try, and the smell is wonderful! If this isn’t enough there was an extremely generous welcome pack of food which includes a serious selection of local and very tasty produce and a very nice bottle of bubbles (no names just in case selection changes, but you won’t be disappointed. In addition to this, the cottage is set at the end of a long track and there are so few passing cars the silence is deafening, talking of which the back of the cottage backs on to a sea loch and we saw a seal most days. It has to be said, if you are used to a Costa coffee and pizza most days you will be disappointed, (the island has none of these) but give it a few days and you acclimatize to way of the island and the way of life it offers, and you feel your springs winding down. Absolutely wonderful!!!! The restored cottage is a masterpiece of love and commitment and is a great tribute to the the owner's ambition and foresight. It really is 5-star accommodation with a wonderful kitchen, and a bathroom straight from a 5-star hotel. Ideally situated, it is a great base to explore the islands. We had a lovely stay in the cottage and enjoyed the box of groceries, my partner also enjoyed the champagne. It was lovely and cosy with the peat fire going. Had some incredible sunsets from behind the cottage. Loved seeing the wildlife - seals, cuckoo sitting on the telegraph pole and calling plus all the other birds. Bed was so comfy and cosy. Enjoyed the fancy shower. We enjoyed a memorable week in Sheiling on the bay which far exceeded our expectations including setting, scenery and the high degree of comfort afforded by the luxury of the cottage and we even spotted an otter !!! Tom and Helen. This was accommodation priced rather more highly than average but was luxurious and wanting for nothing in terms of equipment. There was a warm welcome on arrival, and a magnificent welcome hamper that allowed us to dine on smoked salmon and champagne on our first evening! The peat fire was our first experience and gave a sense of authenticity to our holiday in a thatched blackhouse. The nature of the style of accommodation with its small windows meant that natural illumination inside was limited, and views over the loch needed to be taken from outside, weather permitting. Wi-fi and Sky TV was available in with the price of the rental. The cottage is centrally placed to facilitate exploration of North and South Uist, with a visit to Barra as an option. The Orasay Inn serves good food at various prices and is a ten minute walk from the Shieling. Angus kept in touch to make sure our stay was problem free. All in all, this was a wonderful holiday in a part of Great Britain that has us returning again and again. We have below indicated we would not return but only because as a principle we prefer to try something new each time we take a break. Our third visit to Shieling by the bay and once again it was fantastic. Another great welcome pack and there is everything you need whether you want to go out for the day or stay in and relax at the cottage. Angus is a fantastic host and cannot do enough for you. We will return. We have been staying in self-catering properties on the west coast of Scotland for 30 years. The Sheiling by the bay offers a level of comfort and relaxation that we've never experienced before (it is reminiscent of a luxury boutique hotel). Everything you might want (e.g. a tea cosy!) has already been thought of. The welcome pack of smoked salmon, oat cakes and champagne sets the tone right from the start. It was also really good to understand the history of the Sheiling and the journey which it has been on. The peat-burning stove was a delight - we now want one. The location by the little bay and at the end of the public road is perfect for sitting outside quietly and relaxing. Would love to still be there! My second stay. It is fully deserves it 5 Star rating; I wish I could give it more! It is very well equipped and there a plenty of information about the islands in the Shieling. Angus, the owner, was very responsive to any queries and very helpful in resolving an issue I had. The welcome pack was superb and much appreciated. The Shieling on the Bay - paradise! I love this cosy home, arriving, Lena waiting at the door, the smell of the machair flowers candle alight on the table , the champagne seductively nestled in its ice bucket, the yellow roses, the peat piled high waiting for that magnificent fire to be lit and the lovely welcome box of goodies. This is paradise and deserves a 6* award. I love the artistic carpentry and the mini museum of artefacts.... the suspended spinning wheel, national dried milk! the accordion. I love the free standing bath, the Hebridean bath products and the shower with all the extra nozzles! and the ghd hair straightener ( good choice) and the hot water bottle, what more could anyone ask for! I also love these islands, from arriving by air, landing on the beach at Barra and during our stay driving north to Berneray. I think we have driven on every road on these islands. We have loved the beautiful white sandy beaches and have taken a long walk on West beach Berneray and at the RSPB reserve in North Uist , gazed at the aqua marine sea and been enchanted with the landscape of the Uists peppered with innumerable deep blue lochs, the never ending expanse of sky providing a special quality of light which creates a kaleidoscope of colours unique to these Western Isles. Despite the weather ( mostly gales) we have seen 2 eagles, corncrakes, larks, plovers and oyster catchers, wild Eriskay ponies, highland cows blocking the road, sheep and a lot of lambs and a herd of magnificent stags and we have seen seals, but sadly no otters. But I love the idea of sitting outside this stunning shieling, glass of wine in hand, watching the sun going down, absolute silence ....just waiting for an otter to appear! Well maybe another glass of wine will help! Well done Angus and family for keeping this wonderful family history alive and restoring this magical blackhouse, we very much hope to return in the future. My wife and I stayed here to celebrate our honeymoon and the cottage either met or greatly exceeded our expectations in every possible way. Angus and his family have done an incredible job of restoring this cottage to its former glory on the outside and turned it into a luxurious home on the inside. The cottage sits in a remote location and has beautiful views front and back, along with ample outdoor seating for picnics (weather permitting)! Every single room has been fitted to the highest standard right down to the beautiful crockery and large rangemaster oven in the kitchen. The bedroom is very cosy and the bed very comfortable; the bathroom is elegant and has a beautiful retro styled suite; the lounge has plenty of seating plus a soothing peat burning stove. The cottage is very well insulated and also has underfloor heating so walking barefoot is a pleasure! We can't praise Angus and his family highly enough for the welcome we received, the tasty welcome hamper, as well as the quality of the holiday experience this cottage provides. Thank you for giving us an amazing honeymoon to remember! The cottage is quite simply wonderful, romantic, charming, comfortable, homely and extraordinarily well equipped. It is in a lovely quiet location, next to a small sea loch, at the end of a lane, but only a couple of miles from the main road. It is also very centrally located on the Uists, so well placed to visit North and South Uist, Barra, Eriksay, Benbecula and Berneray. There are great places for walking, whether around rugged coast lines to the east of the islands, along wide sand dunes and beaches to the west of the islands, over moorland or up mountains. The scenery is stark and spectacular, with wonderful colours and moods. We met hardly any other tourists, as far as we were aware, so particularly at this time of year, it is a place to get away from it all. We found the local people very friendly. And Angus, Kirsty & Lena are delightful, determined to make the cottage as welcoming and friendly as possible. We would thoroughly recommend this cottage, as clearly have many other visitors, judging from the visitor's book in the cottage! Staying at The Shieling By The Bay feels like stepping back in time, yet you could want for nothing. It is unique, high quality throughout and has an assured sense of peaceful timelessness. It is warm and cosy and extremely well equipped; we found high quality bath robes among many considerations to make one feel at home. The glow and warmth from the peat burner is rewarding and worry free, we were generously offered an endless supply of fuel throughout our two week stay, especially valuable for those Uist days when the weather challenges the decision to venture out. On clearer days we ascended a short path to summit the adjacent Burn Rock - it's well situated to appreciate fine firework sunsets mirrored in the calm waters of the bay below. We found it a perfect end to the day before relaxing in the Shieling for the evening. We received a warm attentive welcome from the Shieling's hosts, who could not care more for their guests' comfort. There's so much to recommend and discover here, and we so look forward to the opportunity to return for more. Third stay at the Shieling. Nothing compares to its delightful location and perfect comfort. Angus and Lena are lovely people. The hamper of goods and all the extra kept us well fed for most of the week, not that there aren't plenty of good watering holes on the island! WOW!, This one word says it all. From the minute we arrived, we fell in love with this beautiful cottage and its stunning location. The cottage is very well appointed with high-end features including a couples bath, beautiful lounge area, country cottage style kitchen and dining area and luxurious bedroom and furniture. It even has an outbuilding for washing, drying and ironing and it's own peat pile for the fire. The cottage is situated on the banks of a loch and you have access to your own private hill which come complete with picnic bench to help you enjoy the stunning views across the Loch Carnan area. The admin side of booking was simple and the proprietor provided us with a extensive local information and things to do in advance of our stay which helped us make the most of our stay. I have to say the level of customer service was exceptional nothing we have stayed at before even comes close. This is an exceptional place in an exceptional part of the world - you will not be disappointed. Very friendly welcome by the owners including a rich welcome package. Cosy atmosphere in the cottage with a real peat fireplace. High standard kitchen and bathroom. Information throughout the stay and reservation in a local restaurant in Glasgow after our stay in the cottage was organized by the owner. It was just perfect! This was our 2nd visit to the Shieling by the bay following our honeymoon here 4 years ago, but this time was with the wee little addition to our family and did not disappoint. The cottage was as perfect as we remembered and is extremely cosy & comfortable and fully equipped with all the mod cons & luxuries you can think of. The cottage is ideally situated for exploring the islands and is situated in a very peaceful & tranquil environment with an abundance of wildlife on the doorstep and if you're lucky like we was you may even see the odd otter in loch to the rear of the cottage. Our experience from our initial enquiry/booking right through to our stay at the cottage was excellent all round, from providing an excellent welcome pack full of the fabulous local produce to the travel cot & high chair expertly provided for our wee little one. A big thank you to Angus who went beyond our expectations for ensuring our stay went without fault and ensuring we could travel a little bit lighter for our long journey. Also, special mention for Lena who made sure we settled in to the cottage with ease on our arrival. This is a very special place and will always be in our hearts! If you want a restful and quiet getaway with luxury accommodation then The Sheiling on the Bay is ideal. Don't expect a shopping experience or a huge choice in dining on the islands but if you like walking, nature or fishing then the opportunities are endless to enjoy the islands and the surrounding seas. You may have to experience the vagaries of the Scottish weather but when the sun shines there is nothing to beat Scotland and especially the Western Isles. The customer service given by Angus and Lena is excellent from the point of making the booking, welcome and through to the end of the stay with Angus checking how it had been. We could not have imagined a lovelier holiday retreat than The Shieling by the Bay. Picture perfect inside and out, it was the ideal base for unwinding in the magical Hebrides and exploring the beautiful island of South Uist. The wildlife of the islands is stunning, and the immediate surroundings of the cottage are as rich in their flora and fauna as most other areas we visited (though nearby Druidibeg Nature Reserve was particularly outstanding). On arrival at the cottage we were greeted by Lena, given a brief tour of the facilities, then left to enjoy a welcome pack of local foods and a bottle of champagne. Angus who owns the cottage was the perfect host, being very attentive by email and extremely helpful in providing information before our arrival to help us plan our stay. We very much hope to return to The Shieling for another holiday in the future. A fantastic cottage in a lovely location. Very nice welcome from Lena on arrival and Angus provides excellent information before and during your stay on things you can do whilst visiting the islands and is also in contact during the stay to ensure everything is ok. The cottage is very clean and cosy and had all the equipment and more that we could have possibly needed during our stay. On arrival we received a fantastic welcome pack of local produce and basic essentials. We would very much recommend staying at Áiridh a' Bhaigh (The Shieling by the bay) and have already booked a return visit. The croft was beautiful, in a stunning location,comfortable with all the modern appliances one would expect, the interior was immaculate. A superbly equipped, maintained and comfortable cottage, with a level of customer care which was quite exceptional. A very characterful property, it benefits from a fine location and from opportunities within the immediate surrounds to sit out, enjoy the views and soak up the atmosphere. Though quiet, with no passing traffic, there is a pleasant restaurant within easy walking distance and ready access to well-furnished shops, even on a bike. We had a really lovely holiday in a beautiful part of the world. The cottage is very comfortable and Angus and family went out of their way to be helpful. We have already recommended The Shieling to friends. It is the perfect place to stay if you are visiting the Uists. The location is good, beside a small loch and roughly half-way up the islands. It has all the modern comforts yet at the same time it is a historic building. Angus has done a great job in restoring this cottage. The peat stove is great fun and very easy to use and the kitchen is very well equipped. 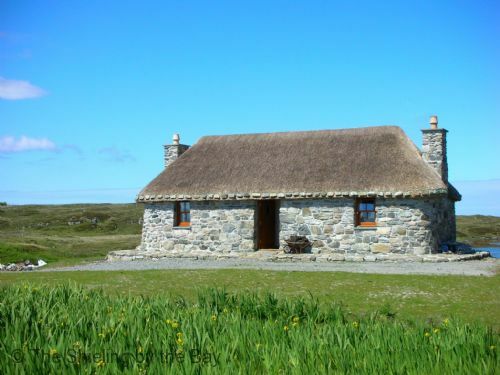 This cottage is just a perfect place to stay for visiting the outer hebrides. All the rooms are in best condition, equipment is excellent. Being a fan of remote places, I can absolutely recommend the Shieling by the bay. Angus, the landlord, is always there on case you need help or advice. In total, I would rate this cottage with six out of five stars. Just perfect!!!! This was our second visit to the Shieling by The Bay and we thoroughly enjoyed it. The property is well placed to explore the whole island chain and is beautifully situated on the side of the loch. There is wildlife in abundance & the cottage itself is a real 'home from home'. There are numerous little touches that make the while experience even more magical. The customer service from Angus & his team is second to none. We visited during the gales in November 2015 & Angus was in touch well in advance to ensure we knew where the candles & battery operated lights were kept, so we were prepared just in case there was a power cut...which there wasn't! The welcome pack was delicious & the roaring fire which greeted us as we walked into the cottage was very much appreciated on a cold, wet November evening! Thank you once again Angus, I'm sure we'll be back...maybe in summer next time, as we'd love to explore the coastline from the water! Third stay there - that´s telling everything, isn´t it!? In three years, we spend five weeks in this wonderfull cottage. Again we had a marvelous time: Shieling by the Bay, the surrounding and the whole Island ist a great place to stay, to watch birds, otters, ...Time to rest! A stunning cottage in a beautiful loch-side location. The cottage is a beautiful stone thatched building standing beside a loch. The interior is adorned with bespoke fittings and furniture throughout and is simply luxurious. We have stayed at many cottages throughout the Western Isles but never at one such as this which had absolutely everything you could possibly need from kitchen utensils, to even a bathroom gown. The area has its own doorstep wildlife. We saw Hen Harrier and Merlin over the cottage and seals in the loch. Angus provided us with substantial pre-trip information which helped us make the most of our visit, particularly useful as we were first time visitors to the Uists. On arrival we were met by Katrina who was standing in for her sister Lena. She gave us a very warm welcome and comprehensive tour of the cottage. We were also presented with a lovely hamper consisting of smoked salmon, scallops and a quality champagne. During our two-week stay, Angus contacted us by both email and once by phone to check that we had everything we needed and ensure we were enjoying our stay. This never felt intrusive and in fact he gave us information which helped us see otters at Loch Ainort. We had a fantastic fortnight discovering the beauty and wildlife of these isles with the added bonus of knowing that we would be returning each evening to a lovely warm cottage with a peat burning fire. Everything about the cottage and the island is breathtaking. We loved our stay and it won't be long until we return. It was a real change to stay in a cottage which is such as strong part of the history of the island. Angus has done an amazing job in restoring the property. It is ideally positioned to explore all of the islands in the Outer Hebrides. Very relaxing. Self contained luxury. We did not find many encouraging reviews for dining out. And with the exception of the nearby 'Deli' cafe and the Hotel near the stone circle on North Uist, local lunch halts were very disappointing. We cooked at the shelling every night - sirloin steak from the local butcher/baker, scallops smoked salmon and lobster. This is luxury taken to the next level. Everything about the cottage is absolutely sensational, from the superbly equipped kitchen to the wonderful hand-made bedroom furniture and the top class bathroom fittings. You even have the full Sky package although given the beautiful setting of the property you might not even use it. To top it all, the care and attention of Angus and Lena made it an incomparable stay for us. An outstanding property with evrything one needed. 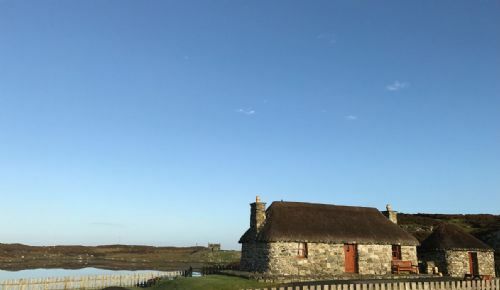 A visit to The Shieling by the Bay is a bit like experiencing a taste of a bygone era … but one that is likely more luxurious than that of the original inhabitants of Uists’s archetypal ‘blackhouses’. The building has been restored with great care, love and attention to detail. When we came back from a day’s exploring we lit the lamps and the peat fire/burner each evening to accent the cosiness. So lovely! Angus, the owner, and Lena who welcomed us upon arrival were very very kind - a trait we encountered all over the Hebrides. From the many small touches, it is clear Angus wants visitors to have a wonderful experience of a rare part of Scotland … and for sure we did just that! 1. the welcome and customer care is great, they really go out of their way to help you make the most of your time, but without intruding , the welcome pack was great. 2 the cottage was incredibly comfortable and well through out , everything that you might need was there . The bathroom was beautiful and luxurious without looking out of place. The decor was just right. The location also is great - really in the middle of the Uists - we explored from Berenay to Eriskay in day trips, and locally had seals swimming behind the house. The cottage is fabulous. Amazing location and the service is second to none. We had a wonderful,peaceful time even though the weather was unpredictable. It didn't matter. The Outer Hebrides are amongst the most beauful places we have visited. The beaches are so beautiful thank god for the unpredictable weather or they would be overcrowded. Would love to come back. Spent a fantastic week in this beautiful cottage in the Uists. From the warm welcome on a very rainy night by Lena to the care and attention from Angus this truly was a memorable stay. The cottage was immaculate with attention to detail the best I have experienced in my many years of travel. The quality of furnishings, bedding, toiletries were all of the highest standards as was the welcome pack. It's in a great location to explore both North and South Uist as well as Eriskay and Berneray and was always a pleasure to return to after exploring these beautiful islands. Can't recommend this cottage highly enough. Thank you. 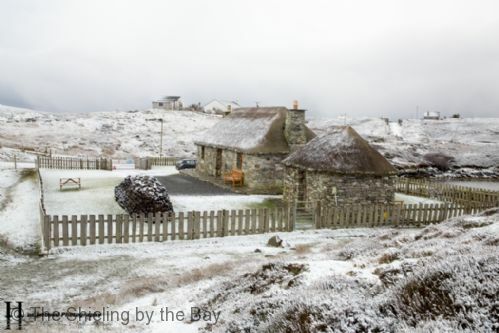 We had a week of mixed weather but the shieling by the bay did not disappoint,from the welcome by Lena and a seafood supper provided to the cottage itself which had every possible comfort,the bathroom is wonderful and constantly warm. the daily wander up to the Burn Rock behind the cottage is a must for the views and sense of peace. Thanks Angus. An outstanding cottage in a wonderful location. A most delightful cottage, sympathetically restored to a very high standard. The setting is amazing with your own viewpoint, loch and easy walks across the headland from the cottage. The owners attention to detail and our well being before, during and after our holiday was outstanding and made for a truly relaxing stay. The highlight for us was watching the sun set from the viewpoint on the hill overlooking the loch accompanied by the Hebridean sheep, skylarks and resident cuckoo, not to mention the seal wallowing about in the seaweed! Although designed for 2 this traditional cottage has everything (and I mean everything ) you might want during your stay. The welcome pack was superb and the rooms comfortable. The cottage is in a lovely spot (although as it is listed it does not have panoramic windows) with plenty of outside space and eating areas and if it is wet a lovely and well stocked peat burning stove. The nearby (5 minutes walk) Orasay Inn does good local seafood. Overall we would highly recommend this for a couple looking for access to the lovely outdoors on Uist or just a snug retreat. We spent one week in the cottage. It was a present for my wife's 50th birthday. Everything was so perfect, the location is beatiful, the house looks beautiful from the outside and is very cosy inside. Especially we loved the peat fire. Also the equipment inside the cottage is very good: A large gas stove, wifi, washing machine, dryer, microvave oven, nothing is missing. We also were very delighted with the welcome package. It even included smoked salmon and a bottle of real champagne. Finally the welcome by Angus was very warm and friendly. Of course the rent is quite expensive, but I think it's worth it. It pains me to be writing this because it means we're home, back in the land of noise and rush hour. Having spent 7 days in this beautiful cottage I'm not sure much will live up to my expectations anymore. From the moment I first made an enquiry to coming back home Angus has been a true host. Lena’s welcome was just lovely as she took us through the cottage and explained everything to us. There is nothing that hasn't been carefully thought of in Áiridh a' Bhaigh , from the highest quality bathroom fittings to the pen and paper if you need it! Everything is clean, immaculately kept and maintained and just perfectly pitched for the style of the cottage. As has been said in other reviews - the perfect combination of tradition and modern. There really is too much to say, none of it negative and it’s difficult to see how anything could be improved. Before the end of the first day I’d said to my husband ‘we’re coming back…’ and we will. Thank you Angus and Family, so very much for sharing this wonderful place. Angus (and family) provided (yet again) a holiday that is out of this world. The weather (once we managed to get on the island!) treated us very kindly. The Shieling has everything you want. It was so cosy even on the frosty nights and snowy days. It is located close to spectacular scenery and varied wildlife - even a dolphin appeared in the bay. We thoroughly enjoyed our stay at Áiridh a' Bhaigh - could have stayed forever. The cottage is in a beautiful setting, in a perfect location for exploring the whole island chain. It is very well equipped and extremely comfortable - a true 'home from home'. Can't wait for our next visit! Perfect cottage in perfect location. Made extremely welcome and the welcome pack was of v high quality and greatly appreciated. Would return in a heartbeat!! We were very impressed with the cottage; it was of the highest standard and extremely comfortable. Angus had thought of everything we could possibly need and rang us on two occasions to make sure it was all to our satisfaction. A very enjoyable holiday for our 'special' anniversary. In our opinion this truly is a gem tucked away in the Islands of Scotland. On our arrival we were met by Lena, a bubbly and friendly local girl who showed us around the cottage and its amenities as well as providing us with a superb welcome pack of tasty local produce to see us over our first few days, many thanks to Angus and his family for that. Inside of the cottage did not disappoint, a large comfy bed, bespoke furniture and fittings and everything you could possibly want from peat for the fire to ice making machines. Obviously a lot of thought has went into the needs of dwellers within the cottage. The cottages location in my opinion is well situated for exploring North Uist, Benbecula, South Uist and Eriskay and local shops with all your needs about 4miles away as well as this there is a small sea loch at the back of the cottage with an abundance of wild life including the elusive otter. Within the cottage there is information about the islands, more than you will need from walks, day trips as well as the local history including the history of the cottage. If you are looking for that elusive getting away from it all trip, or something special for someone special, this is it. Once again thanks to Angus, his family and his little helpers for a truly enjoyable experience. This was our second visit to the Shieling by the Bay and we decided to come here again because we knew we would have luxury accommodation in stunning surroundings. The cottage is wonderfully appointed, with everything you need to make your stay comfortable and memorable. As an illustration, the bed is the most comfortable I've slept in anywhere I've stayed. We were once again greeted by a generous welcome pack with lots of local produce and it is the touches like this along with the care offered by Angus and his extended family, that make visits here so special. The Sheiling by the Bay lived up to expectations - we were especially impressed by the attention to detail and the care shown to ensure that we enjoyed our holiday. Everything we needed was provided in the cottage, including a good selection of local information to add to the information which was sent beforehand. Lena was very welcoming when we arrived, and the hamper was excellent. The kitchen and bathroom were both very well equipped and clean. This is a superb base from which to explore the Uists, Benbecula and Eriskay. The Sheiling is rated as top end accommodation, and deservedly so. We would have no hesitation in returning. Although we had very good weather during our stay, the Sheiling would be just as good in winter as a cosy hideaway. Airidh a' Bhaigh is a beautifully refurbished traditional black house in South Uist. The cottage offers luxury in a remote part of the Hebrides. Despite the modern upgrade, there are tasteful nods to the past and a warmth throughout the building which reflects the care put into the renovation. Every need is catered for in the house. Angus was the perfect host before and during our visit, taking time to ensure our stay was as enjoyable as possible. We thoroughly enjoyed our week. There is absolutely no wish open - and we are already planing the next - third - time. We were at "The Shieling by the Bay" the second time. As last year, we were completely contend and had a great time. As we have in comparable cottages in other countries, we appreciate the special atmosphere here. The service from Angus the owner was first class, the house and setting just stunning, if your looking for somewhere just that little bit special to stay while on the islands you will not find better. Serenity,atmosphere and history all rolled into a little piece of paradise. The most wonderful property we have ever stayed in. Open the door out and all you could hear ... the birds, the sheep and the wind. Many lovely touches. A little corner of heaven! The Sheiling by the Bay is simply the most perfect little place. We arrived to such a warm welcome from Lena - peat fire roaring, champagne on ice, salmon and other goodies chilling in the fridge! Every inch of this property is equisite and so very well thought out! There was nothing missing at all! Beautiful hand made bespoke furniture, a bath you could spend hours in, a kitchen so well equipped - even an ice maker in the out house! So cosy and a real pleasure to come back to after a days walking. Then there is the location! In our minds it was again simply perfect! Basically at the end of the road, so no traffic at all. Your own loch - your own hill - both with benches. Perfect spots for breakfast / and evening drink or two! Sheep and lambs grazing, red breasted mergansers on the loch, cuckoos cuckooing, eiders bobbing around - oh we were so very sad to leave. Great general location too i.e. being at the north end of South Uist. Made exploring very easy. Great location to take advantage of the RSPB corncrake walk at Howmore (location changes throughout year) and the raptor walk too. Angus and his familly have done a stunning job rennovating this beautiful sheiling that has been in their family for so many years and we are very grateful that they allowed us to share in it. Worth every single penny! We will most definitly be back. A stunning property in a stunning location! THANK YOU! This place is a fantastic luxury cottage for 2. Everything was perfect, including the weather. The setting is just outstanding. Lovely peat stove, the welcome hamper included local fish, champagne and other luxury goodies. The quality of the interior is very high. It's an ideal place to explore the islands, especially if you love wildlife. This is a stunning cottage located in a stunning location. The attention to detail, comfort and ambiance is far beyond anything I have ever experienced in self catering property. From the initial welcome to the moment of leaving everything was perfect in The Shieling by the Bay. As for the location this also is stunning - marvelous beaches, great food in the hotels and restaurants, and a new vista round ever corner. Uist is the place to be - and The Shieling by the Bay must rank as a world class property. Thank you Angus. We have stayed in a lot of cottages and this is the best one. The quality and attention to detail was second to none and it was a beautiful base, which felt like a home, to return to when exploring the Uists. It is a very generous cottage from the amount of towels to loo rolls to the welcome basket of champagne and scallops. These details can make an experiencing very special and memorable. A fantastic location and accommodation to do it justice. Everything that you may need is in the cottage and the service from Angus and Lena was generous, friendly and efficient. I could not recommend this cottage enough. We will be back. Wonderful experience, thank you. Fabulous cottage in a great location. Very sweet host and a warm welcome. We are already considering which dates to book for next year and my parents have booked this morning for later this year. We stayed for 5 nights in January 2014 as part of our honeymoon. We had already had a week in another cottage on Lewis before coming to the Shieling, and it was only when we arrived at the Shieling that we both felt a real sense that our stresses and strains were easing away. The Shieling is absolutely beautifully renovated, and decorated with an unusual and quirky sense of style. We loved it. It has a luxurious feel, and yet is so cosy and welcoming, it would be impossible not to relax and unwind here. On top of the cottage accommodation itself, are Angus and Lena. The attention to detail before, during and after our stay was second to none. Angus is an amazing host, very caring and genuine. He sent us emails before we arrived, checking on our likes and preferences, and kept in touch while we were at the cottage to make sure everything was ok. Lena, who welcomed us to the cottage, was so friendly and helpful. A welcome pack of local salmon, coffee, milk and even gluten free bread awaited our arrival. I couldn't recommend this cottage enough, it was one of the nest places we've stayed. Thank you Angus, for everything! If you're looking for the perfect cottage for a get a way from it all break then you've found it. It was high end yet wonderfully comfortable and the attention to the little details simply outstanding. Couldn't recommend higher. We found a very polite and warm friendly welcome. The Cottage is in every Sense familiar, cosy and modern. The shelter with washer is goog organized. The Cottage is very nice located on a absolutly marvelous prepared ground. The contact with the owner is helpfull and goog Looking after. To enjoy a Good Whiskey at the peatfire is a rare luck for Germans! Exquisite and beautifully-presented hebridean hideaway - warm welcome, and an excellent complimentary food pack on arrival. All equipment and facilities were of the best quality and the wifi connection was fast. We had a super week here and would absolutely recommend it. We ate well, we went to the beach, walked in the wind, festered and chilled, drank wine by the stove, had kippers for breakfast - an all round fantastic experience. When we arrived, we were blown away by the place. The welcome basket was great - we had been dreaming of "proper" kippers and fish for so long and it was there. Will be back!!! This was my second time staying in this wonderful thatched cottage and both times I've been impressed by the fantastic information provided before arrival, the luxurious touches that ensure you'll have a memorable stay, rain or shine, and with the awe-inspiring beauty of its location. It's perfectly located for exploring the rest of the Outer Hebrides on fantastic day trips - and Angus is always happy to advise. My boyfriend joined me this time and was likewise taken with this peaceful retreat and keen to return to enjoy more gorgeous sunsets over the bay before heading inside to the peat fire. The cottage is magnificent. It has been lovingly and tastefully restored into 5-star luxury accommodation. It has everything you could possibly require for a first class stay. It is comfortable and quiet, with a beautiful outlook over the loch. You receive a warm welcome and a wonderful selection of luxury "goodies", including champagne and handmade chocolates. The bed is extremely comfortable. The shower is excellent and there is a plentiful supply of luxury towels and toiletries. Dressing gowns are also supplied. The kitchen has every utensil you can think of. It is stocked with teas, coffees, salt, pepper, etc. We have never before been to a cottage that provides basics like these. The information provided by Angus before we arrived, and the information in the cottage itself, is comprehensive. We had a fabulous break in this cottage and would thoroughly recommend it to anyone looking for a cosy, indulgent, peaceful and relaxed holiday, away from it all!